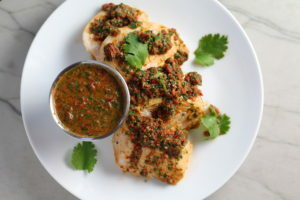 Most people have had Chimichurri, but how about Chicken Chimichurri Rojo? 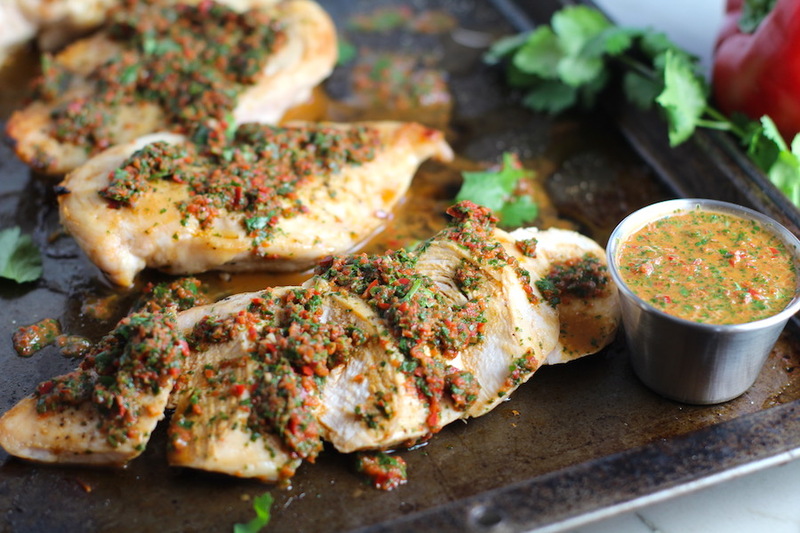 It’s a perfect Spring or Summer dish because you can simply grill or broil the chicken then top with this make-ahead cool, fresh, oh-so-delicious Chimichurri Rojo. 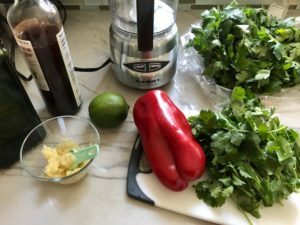 The Rojo comes from the addition of red pepper and combined with the other ingredients, this sauce is cool, tangy, sweet, savory and incredibly full-flavored! 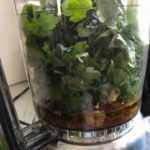 All of the ingredients get blended in a food processor so it could not be easier! 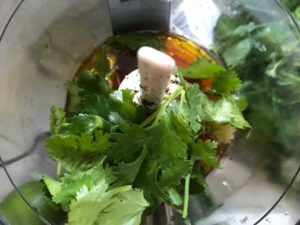 With garlic, parsley, cilantro, lime, vinegar, and red pepper, this is one easy sauce that delivers BIG flavor! This is a perfect recipe for easy Meal Planning as it’s so easy to prep ahead. 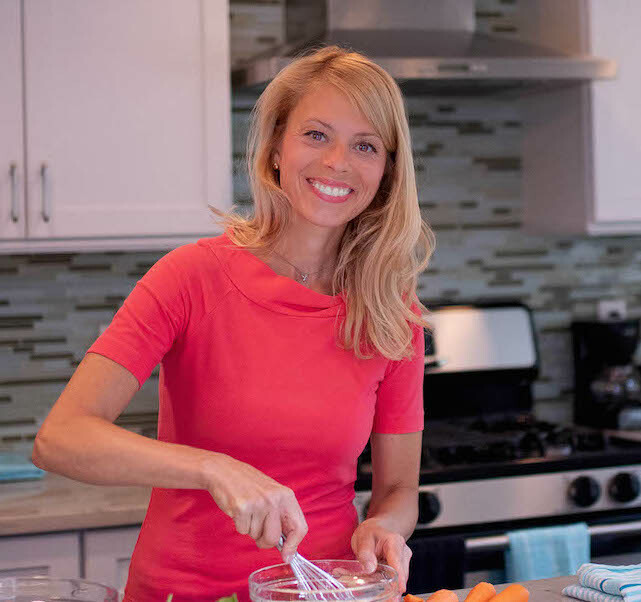 Check out my Free video Kickstarting Meal Planning if you want some easy printable tools for meal planning! 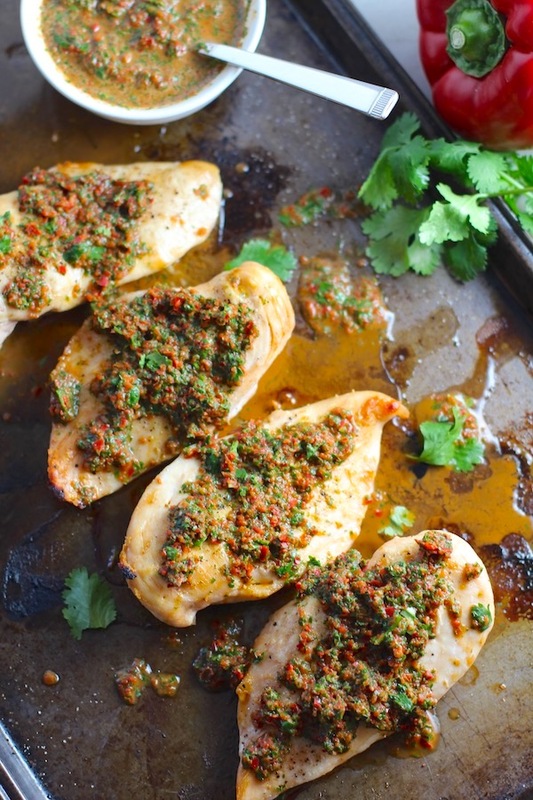 Easy, Healthy, Zippy Get-out-of-a-Chicken-Rut Dinner! Chicken is great because it’s a lean protein that’s incredibly versatile. However, if you’re not careful, you can fall into the da..da..daaaaa…. Sound familiar? 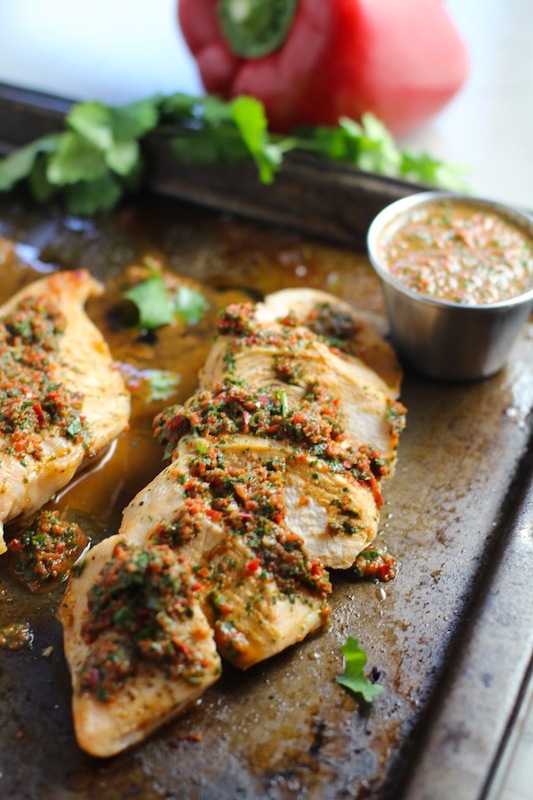 Well, this Chicken Chimichurri Rojo is an amazing and easy way to get out of the rut! 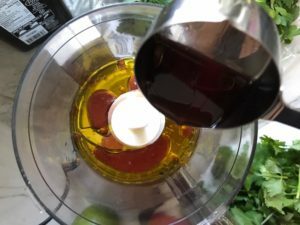 The Chimichurri Rojo can be made days in advance. 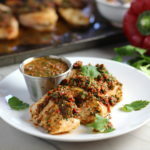 And it completely transforms an otherwise boring plain chicken into a zingy, zippy, magnificently flavored dish! AND, it’s healthy with only olive oil, a healthy fat, herbs, and veggies. 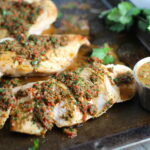 This is one of those wonderful recipes that you can make mostly ahead by making the Chimichurri Rojo or entirely ahead by grilling or broiling the chicken as well. 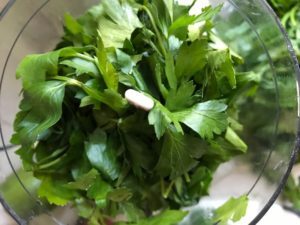 So, let’s start with the Chimichurri! 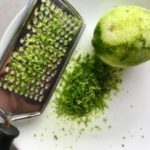 First zest the entire lime and then cut in half. Cut the red pepper into medium size chunks. 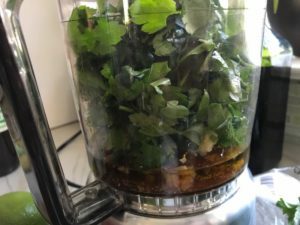 The Chimichurri Rojo is so easy to make in a mini food processor. Just add the olive oil, vinegar, lime juice from 1/2 the lime, garlic clove, cilantro leaves, parsley, salt and pepper. Cover and pulse until the herbs have blended enough to make room for the red pepper. 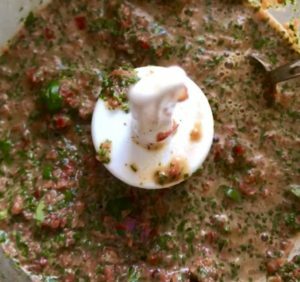 Add the red pepper chunks, then cover the processor and pulse to get it started, then blend until everything is about the same size and the there are no large chunks of garlic. Last, stir in the lime zest. Store in the fridge until ready to serve and eat! 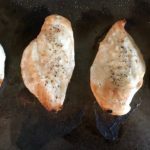 You can really cook the chicken any way that you want, whether that’s grilled, in a skillet, roasted in the oven, or broiled. For this recipe, I have broiled the chicken because you can get that yummy charred flavor any time of the year. Season each side of the chicken breasts with olive oil, salt, and pepper. Place under broiler (High) for 6-7 minutes or until you start to see a black char on the top of the chicken. Then take them out and flip them. Put them back under the broiler for another 6-7 minutes. At this point, they will be nearly done, so check the internal temperature and if you are not yet to 165 F degrees, then cook them for another 10-15 minutes in the oven at 350 F degrees. When the chicken is done cooking, let it rest for about 5 minutes so that the juices soak back into the chicken and it stays moist. Zest the entire lime and then cut in half. Remove the seeds from the red pepper and chop into chunks. While the chicken is cooking (see below) or in the days before (up to 5 days in advance), you can prepare your Chimichurri Rojo in a mini food processor. Just add the olive oil, vinegar, lime juice from 1/2 the lime, garlic clove, parsley, cilantro leaves, salt and pepper. Cover and pulse until the herbs have blended enough to make room for the red pepper. 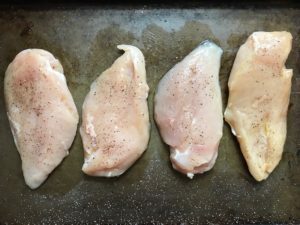 Season each side of the chicken breasts with olive oil, salt, and pepper. Place under broiler (High) for 6-7 minutes or until you start to see a black char on the top of the chicken. Then take them out and flip them. Put them back under the broiler for another 6-7 minutes. At this point, they will be nearly done, so check the internal temperature and if you are not yet to 165 F degrees, then cook them for another 10-15 minutes in the oven at 350 F degrees. When the chicken is done cooking, let it rest for about 5 minutes so that the juices soak back into the chicken and it stays moist. You can serve 1 breast per person, but I like to slice them all on a bias and serve each person 3-4 slices to start. 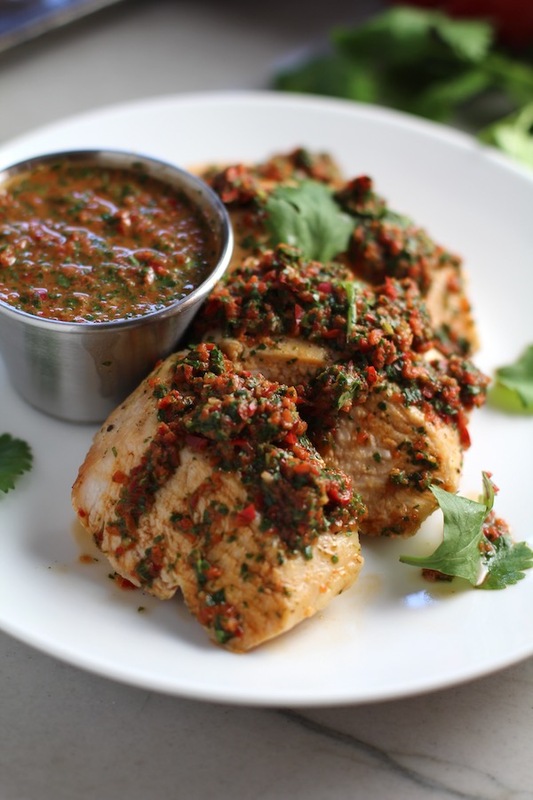 Spoon the Chimichurri Rojo over top (it can be served cold or room temperature) and Enjoy! 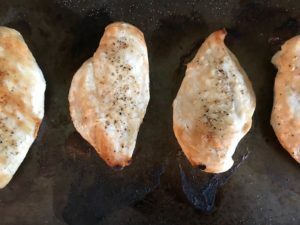 While there are only 4 chicken breasts in this recipe, if you slice the chicken, you can easily extend the serving size to 5 or 6 by giving each person 3-4 slices.